Mercury cells (also referred to as mercury batteries) are batteries with a mercury oxide electrode. The manufacture, transport or sale of these batteries is banned or restricted in many jurisdictions, though some are still made in Russia. Before such bans, many cameras and lightmeters were designed to use them. Because mercury batteries produced a constant and reliable voltage, these devices were built without voltage regulation circuitry. Unless remedial measures are taken, use of other kinds of batteries gives inaccurate meter readings and therefore incorrect exposures. Many cameras and lightmeters where designed for and require a 625 mercury cell (see a list of cameras and list of exposure meters). Some cameras and exposure meters were designed for 625 sized cells but include voltage regulation circuitry and thus do not require a PX625 to function properly (list of devices). Mercury batteries came in number of different sizes including the 32, 400, 625, 640, 675 and the like. 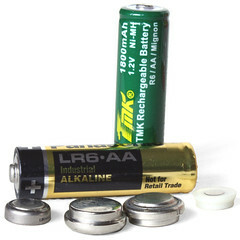 Most of the mercury batteries are a single electrolytic cell - usually small and circular. However, the 32 is a set of 4 stacked 640 cells. The greatest number of cameras, finders and light meters were designed for the PX625. Suggestions from Rick Oleson (based on ideas from Leon Schoenfeld) to make classic cameras give acceptable meter readings using modern alkaline batteries. The mercury cell problem and its solutions (PDF file) by F. de Gruijter. Also discusses PX675 and other mercury batteries. Russian mercury px625 battery Seller of PX625 mercury batteries. Popular Photography, October 1993, p. 130; January 1994, p. 144; September 1994, p. 144; and August 1995, p. 66. This page was last edited on 17 May 2016, at 05:33.